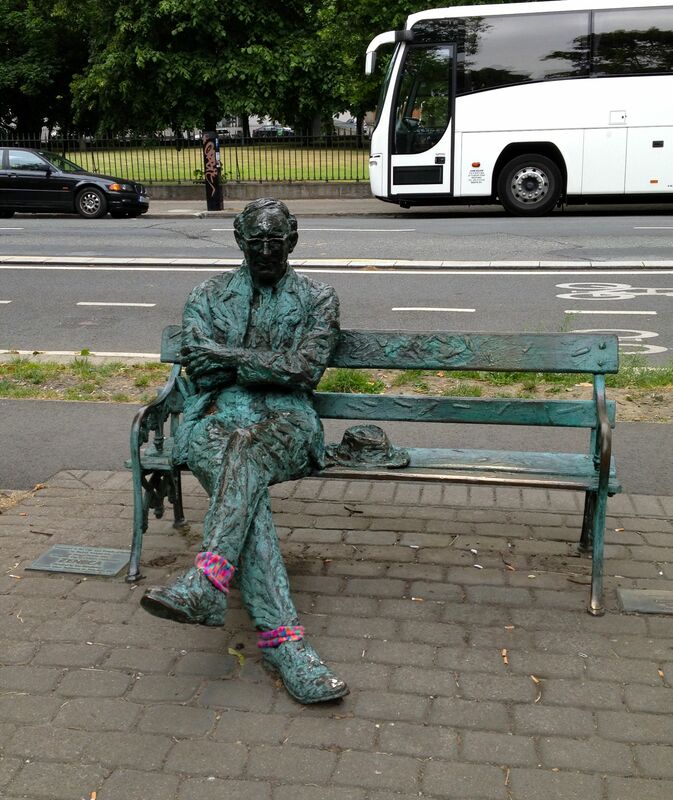 It was just a matter of time before the guerilla knitting would stretch a little to left, and land on Patrick Kavanagh. Just a little. Today, Patrick got himself a pair of socks. And I had a few more interesting conversations – one aul guy said he was also from County West Meath, and that “We only send our bad poets to Dublin,” before taking my picture and laughing at his own joke. A country bus driver and I had a long chat, telling me that – being known as a grumpy old fella – Patrick Kavanagh was not known for wearing matching socks. 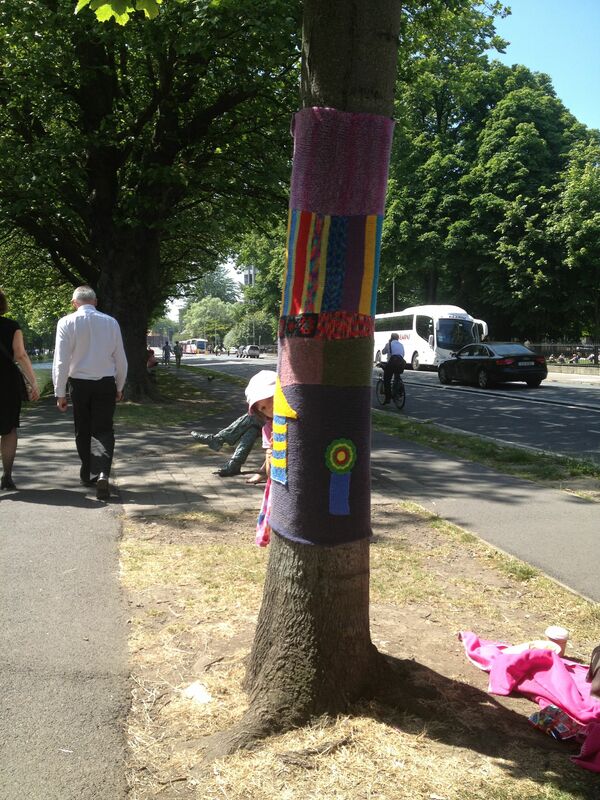 But the bus driver liked these matching socks, and after finding out what Guerilla knitting is, he also took a picture. Then he smiled shaking his head at the concept, and asked me ‘What am I known as? do I have a ‘tag’? God love him! Back to this well-known and much-visited statue / bench. For those not native to Ireland, Patrick Kavanagh was a renowned poet. Who was also remembered for enjoying a pint, sometimes a little too much; for his disheveled appearance; and perhaps a robust exchange of views here and there. My mum told me, (after smiling at the socks in situ, replacing the slightly baffled look she gives me when I’m often knitting) that local legend says he was barred from a few of the local pubs. Including one a few hundred metres from where his statue/seat has sat for a decade or two, and another ‘Canal bank seat’ for four decades or more. Mmmm. Seems Patrick had the last laugh there. Writing this post has prompted me to look up some of Patrick Kavanagh’s poetry again. Though I’m no poetry afficiniado – reading “Lines written on a seat on the Grand Canal, Dublin,” has moved me all over again. I so appreciate this man’s talent, and I remember my Dad. Who like Patrick Kavanagh, often sat next to the canal while recuperating through that dreadful disease. Patrick survived it, but Des didn’t. And other far-flung towns mythologies. Tomb - just a canal-bank seat for the passer-by. So here’s a picture of Dad’s tree, complete with his first granddaughter. I love Paddy Kavanagh. Great poem and I love the socks. More than fluoride in the water of Dublin. | Cynical Dubliner! !